English Mountain Recovery is a private residential treatment facility in the heart of East Tennessee’s Smoky Mountains. Offering a gender-specific foundation for physical, emotional, and spiritual healing, we tailor our services to your budget and recovery objectives. EMR admissions counselors take your addiction severity, medical history, and lifestyle into account as we help you select a TN addiction treatment program. English Mountain Recovery’s treatment philosophy is rooted in the 12-Step program as outlined by Alcoholics Anonymous. Upon arrival, you will receive an English Mountain Recovery workbook and a 12-Step recovery handbook. Incorporating holistic modalities with 12-Step principles, we have built a stand-out residential alcohol and drug treatment center that draws people out of hopelessness into a new way of life. 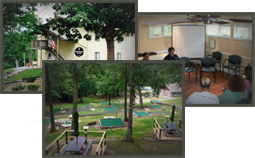 Clients select our facility because of our TN residential inpatient addiction specialty. For over a decade, we have offered men’s and women’s 30- to 90-day drug and alcohol rehab at our secluded 27-acre retreat in Tennessee. These transformational programs are gender specific and designed to reach clients suffering from all forms of alcoholism, drug abuse, and other addictive disorders. During your stay at EMR’s residential inpatient facility, you will sleep, attend therapy, and participate in recovery activities at the same location. Tucked away in the serenity of the Smoky Mountains, you will truly disconnect, rediscover yourself, and solidify your sobriety commitment. To help with this process, we encourage clients to stay as long as their finances and lifestyle allow. Our 90-day rehab programs are the gold standard for addiction treatment. Studies indicate that programs lasting 90 days or more decrease the incidence of relapse and improve overall sobriety outcomes. If you are unable to make a three-month commitment, we offer intensive 30- and 60-day options, as well. No matter how long you stay in our inpatient rehab program, you will receive transitional care that includes therapy referrals, extended care choices, and sober living recommendations. This transitional care protocol encourages accountability and lends clients the support they need to continue the healing process. As an added benefit to our addiction treatment in TN, English Mountain Recovery programs include the option for family counseling. Addiction ravages families and leaves the entire family unit in need of emotional and relational healing. We are available to provide facility tours upon request, and our team of admissions advisors acts as your advocate throughout the insurance authorization and referral process. Begin your restorative journey at our affordable, all-inclusive Tennessee residence, where we proudly serve adults of all ages. Contact an admissions advisor by phone now: (877) 459-8595. For your convenience, you can also reach us online.